When I first began this blog—a long time ago in a galaxy far, far away—I kept a running list of the books I read. It was titled “Good Books” or something of that nature. Shortly after I had my first child, this list stopped. If you’ve ever given birth, which I haven’t, because I’m a man, but even if you’re a newbie parent, you’ll know exactly why this list stopped. Cue Samuel L. Jackson reading Go the F–k to Sleep, a bedtime story for children. I’ve read since 2011 when my daughter was born. Don’t get me wrong. But the words usually rhyme and involve illustrated pictures of cows or trucks and text written in a medium bold Helvetica font 16 points or above. Then there’s Amelia Bedelia, who we have graduated to. Don’t ask her to dress your chicken in the fridge or dust the furniture. But if she offers to make a lemon meringue pie, you answer yes. Her lemon meringue pies are banging. Well, for some odd reason, perhaps because my children are now 4- and 2-years-old, but more-so because I’ve re-learned how to concentrate (read my ongoing series Overcoming Anxiety and you’ll begin to understand why), January was this sort of unexpected re-birth of my reading habit. I read seven books. Seven. Like the movie, but without the cool logo and creepy ending. David Mills: What’s in the box? What’s in the box! Jeff: You should do book reviews again and post them on your blog. And that was the plan. Which really got me thinking about how I spend my time at work, at home, and even in my hobbies. Where am I wasting time on matters non-essential, that don’t really add value to my life? Example A: the Super Bowl. I didn’t watch it this year. It’s the first year I’ve probably ever missed the Super Bowl. It was great. Why? I don’t like football — at all. I’m an NBA guy down to my marrow. Watching the Super Bowl was more out of a habit which has been formed in the American consciousness. Even if you don’t watch the game itself, there’s the commercials. It’s a marketing ploy that works. But not on me this year. I didn’t watch the game. I didn’t watch the commercials. I read a book and drank hot tea. Here’s the thing. I love to write. It’s like water to me. Or the breath in my lungs. Except, well, I wouldn’t die without writing. I would just be extremely unhappy. I used to write a weekly Literature & the Arts column for a newspaper. In it, I would do one of two things: (1) I would review a book I read or (2) I would interview the author of a book I read. I enjoyed the gig. I learned a lot. I met some cool people, read a lot of really good books I would likely not have been exposed to otherwise. It gave me access. But that was 2008-2011 or something like that. And while I enjoyed the type of writing I did then, it’s not the type of writing I want to do now, in 2016, reviewing someone else’s book, particularly not a short review of all the books I read in a single month. But I do still want to share the books I read because I enjoyed them. So, here’s what I’m going to do. I’m going to include a list below of the books I read in January. With them, I will include the official summary from the publisher. I’m not going to sit here and write my own personal review of someone else’s writing. It’s free marketing and advertising, and you know what, someone already did this when they created the summary on the inside flap or back cover or in the New York Times or Los Angeles Times. Why regurgitate it with my own spin? Note: I am not giving anyone flack for reviewing books. I once did it too. It’s just not how I want to spend my time writing any longer. I don’t deem it essential. If the summary of the book interests you, I recommend you check it out — either by checking it out at your local library or by buying it using the link below. Note: I do receive a small commission if you buy it at the link, and if you do, thank you. Running a website isn’t free and writing a blog takes time. A gargantuan, mind-altering comedy about the Pursuit of Happiness in America set in an addicts’ halfway house and a tennis academy, and featuring the most endearingly screwed-up family to come along in recent fiction. But that might not be the best book for you. It was / is for me. And maybe you too. But maybe not. It’s also really long. Really long. As in, 1,079 pages with tiny footnotes throughout. What’s funny is that most of the books mentioned below are quite the departure from the normal sort of reading I do (David Foster Wallace, Thomas Pynchon, Don DeLillo, etc.) — and I have to admit, I’ve really enjoyed this departure. It’s allowed me to learn and think outside the normal box where I operate. The direction of these books relate to a personal journey I am on, which I am covering in the series Overcoming Anxiety. Simplify is a celebration of living more by owning less. Written by Joshua Becker, who inspires hundreds of thousands of people on his personal blog Becoming Minimalist, this is a book that calls for the end of living lives seeking and accumulating more and more possessions by highlighting the enjoyment of living with less. Three years ago, his typical, suburban family of four made the decision to minimize their possessions, declutter their home, and simplify their lives. In so doing, they discovered countless real-life benefits of living with less. And now, to help others experience the same freedom, they offer the most important lessons they’ve learned through the process. Simplify is full of personal stories, practical tips, and powerful inspiration. It is based on a rational approach to minimalism. It will forever change the way you look at physical possessions. And most importantly, its approach will free you from the burden of clutter and provide you with the extra motivation to realign your life around your heart’s greatest passions… however you choose to define them. Children add joy, purpose, and meaning to our lives. They provide optimism, hope, and love. They bring smiles, laughter, and energy into our homes. They also add clutter. As parents, balancing life and managing clutter may appear impossible—or at the very least, never-ending. But what if there was a better way to live? Clutterfree with Kids offers a new perspective and fresh approach to overcoming clutter. With helpful insights, the book serves as a valuable resource for parents. Through practical application and inspirational stories, Clutterfree with Kids invites us to change our thinking, discover new habits, and free our homes. It invites us to reevaluate our lives. And it just may inspire you to live the life you’ve been searching for all along. The author of Full Catastrophe Living explains how anyone can use mindfulness—the art of living each moment fully as it happens—to reduce anxiety, achieve inner peace, and enrich life. Most of us live in a constant state of fear—of our past, of illness and aging and death, and of losing the things we treasure most. But it doesn’t have to be this way, promises Zen master and Buddhist monk Thich Nhat Hanh. 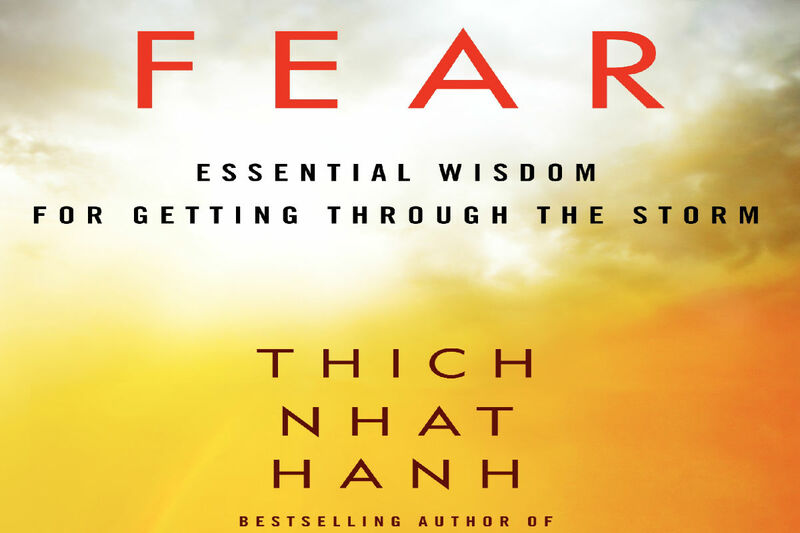 Drawing on a lifetime of mindfulness in action, Thich Nhat Hanh shows us how to use the practice of living in the present to acknowledge and embrace our fears, recognize their origins, and render them powerless. The world-renowned Zen teacher guides us through practical exercises for transforming fear into clarity. The worries of the past and the anxiety of the future disappear as we discover the power of the present moment. Not only are we are able to handle challenging emotions as they arise, but we can summon feelings of well-being and contentment, no matter what the unknown may bring. Rooted in the moment, we have the capacity to restore balance and happiness and be present with what is beautiful and affirming inside us and around us, every day. As a Tibetan lama and leader of Shambhala (an international community of 165 meditation centers), Sakyong Mipham has found physical activity to be essential for spiritual well-being. He’s been trained in horsemanship and martial arts but has a special love for running. Here he incorporates his spiritual practice with running, presenting basic meditation instruction and fundamental principles he has developed. Even though both activities can be complicated, the lessons here are simple and designed to show how the melding of internal practice with physical movement can be used by anyone – regardless of age, spiritual background, or ability – to benefit body and soul. No Kindle? No problem! You can download the Kindle app for iPhone or Android for free. Amazon also has the Kindle Fire at a ridiculously low price this week. Buy it for $39.99. That’s nuts for a tablet where you can read e-books, play games, or watch movies. If you enjoyed this post, I invite you to subscribe to receive notifications of new posts by email. No spam, ever.